Summer is officially here, and hopefully you’ve already tackled spring home maintenance so your family can vacation without worry. 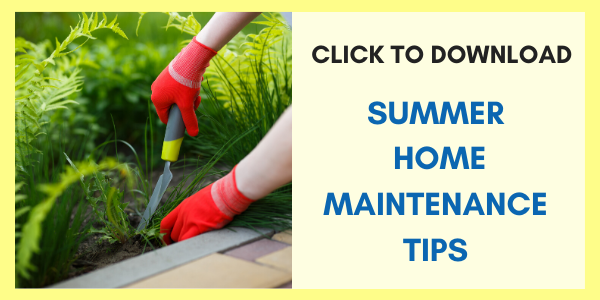 But if the AC hasn’t had a tune-up and the grill is a disaster from last summer, or if you’ve procrastinated waiting for better weather, read on to get tips on how to prep the house and yard for enjoyment all summer long. Before heading out of town for a summer vacation, make sure that AC will be working efficiently upon your return home. There’s nothing like a humid, 87 degree home at 9:30 at night. I know; it’s happened to me. Preventative maintenance on this marvelous feat of science is not to be ignored. The best way to avoid hot steamy nights under a fan is to have a professional check refrigerant levels, fan function, and the cleanliness of the coils. They might also spot a small problem that could turn into a big problem in a matter of time. Professional tune ups are recommend and preferred, but there are DIY options to ensure maximum output. Monthly filter changes will help keep energy costs lower. Clean the AC drain line before a clog forms. A small amount of bleach will clear out debris. Make sure the unit outside has air to breathe. Clear space around of all constricting vegetation. It is recommended to have an 18-inch radius and three feet of space above. An accurate thermostat is crucial to keep energy costs low. Its position in the home should not be near direct sunlight. Double check the scheduling options on the unit, as well. If the home is empty during the day, it might be cost efficient to raise the temperature a few degrees while no one is home. 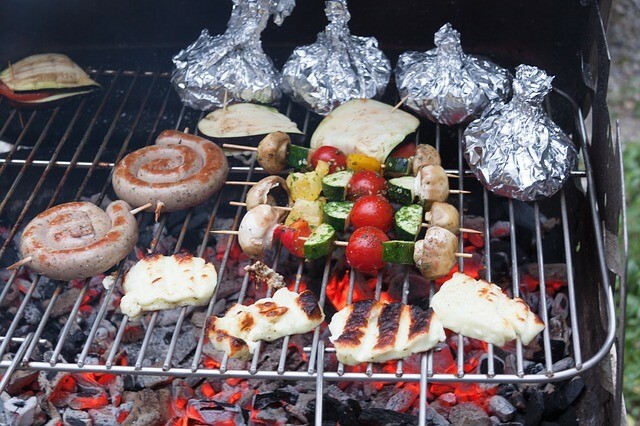 For those who fancy themselves professional grillers, the cleanliness and care of a grill is of utmost importance to ensure proper temperatures to produce the most flavorful food. It’s likely your grill comes with instructions on how to best clean your particular style, so store those directions before taking the grill box to the curb. There are, however, general rules to follow. Gas grills benefit from a thick wire brush and liquid grill cleaner to scrape away remaining food. The burners and covers need scrubbing attention, too. If needed, a toothpick is useful to unplug the holes in the burners. The drip pans may need to be replaced if thorough cleaning doesn’t do the trick. Charcoal grills should be ash free before cleaning with hot water and liquid soap. Rinse thoroughly, and let it completely dry before its next use. Grates can be scrubbed with wire brushes and replaced if necessary. Add a little excitement to your barbeque by adding a colorful coat of heat resistant paint to the outside of the grill for burst of color on your patio. Homeowners spend thousands of dollars to extend their living space outside. Decks and patios become a destination within the home to enjoy year round, so it makes sense to take care of the space the whole family enjoys. Keeping an eye out for any type of damage from pests or weather is the best way to stay ahead of expensive repairs. Boards that are cracked, rotting, or curling need to be replaced. Looking under the deck, you’ll likely find a screw or nail that needs to be replaced as well as other nuisances like a bird’s or wasp’s nest. Professional pest control companies may be needed if the infestation is large. It’s standard for a deck to need re-staining or sealing annually. Power washing the deck and letting it completely dry before removing the old finish is the best prep sequence for new color. Sanding the wood will let the stain adhere evenly. Kids play hard, so it's necessary to keep an eye out for wear and tear on any back yard play equipment. Bolts need to be re-tightened, and splinters and rough edges should be removed. Any weathered ropes or swing seats need replacement. Termites and mold are not your friends. The deck and play areas should be inspected and corrected before too much damage occurs. Get those gutters cleaned to avoid water damage to the house. Double check carbon dioxide and smoke detectors. Clean the dryer vents and the tubing that extends to the outside vent. Use an old pillowcases to surround fan blades and sweep away dust.